When we met the creative powerhouses behind Filigree Suppers at the Cherry Bombe Jubilee this year, it was love at first sight. Five minutes into a conversation, we immediately got the sense that Brita Olsen and Elise Metzger value the little details that go in to putting on the most memorable of dinner parties. So of course, we asked them to teach us a thing or two about setting our own FEED Supper tables, while giving us a glimpse of their own. Read on for their tips on how to set a beautiful FEED Supper table, with a little twist of the unexpected. Tell us a bit about Filigree. Filigree Suppers is traveling dinner series with a strong emphasis on design and American-made home goods. 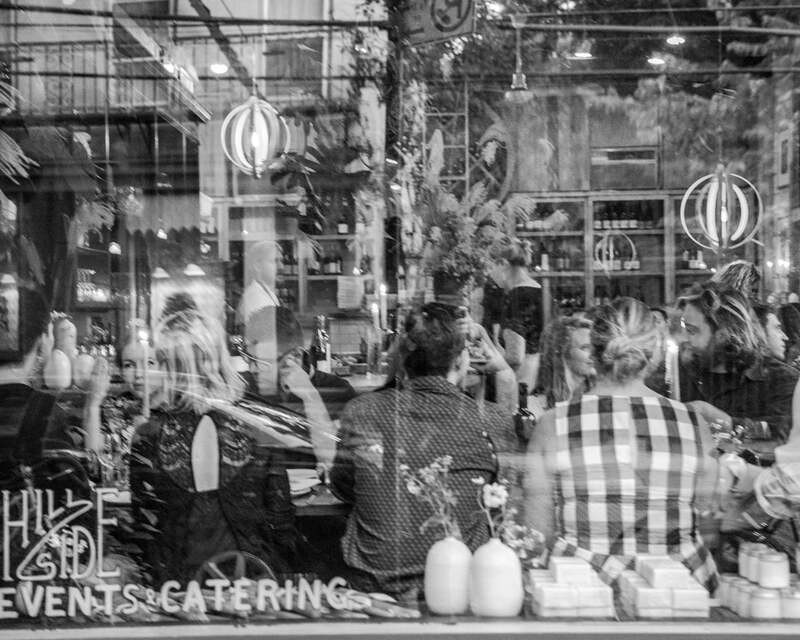 We host monthly gatherings in NYC, Chicago and beyond. Each event is assigned a different theme, which is carried through the decor and menu for the evening. The intimate nature of these 30 person gatherings allows for the feeling of a Sunday supper in someone’s home with restaurant quality cuisine. When you’re thinking about setting a memorable dinner table, where do you start? What are the most important elements of a beautiful tablescape? We love the new trend of unstructured romantic flowers. Centerpieces have become much more approachable for people to replicate at home. Also, we rarely do tablecloths. Instead, we like to add interest through interesting runners or printed napkins. Why did you want to host a FEED Supper? 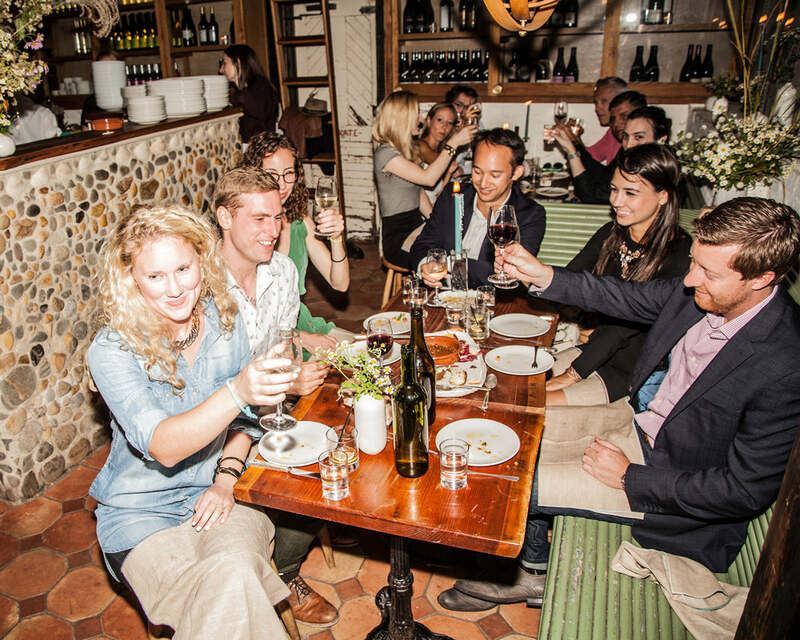 For your FEED Supper, which you hosted at Brookyln’s Vinegar Hill House, how did you approach the table? Local florist, Fox Fodder Farm, provided a giant show-stopping arrangement as well as beautiful bud vases of chamomile and wild grasses, which we interspersed with tall beeswax candles by Greentree Home Candle. We loved the way the candles added a warm glow to the room and dripped down the glass candleholders as the evening progressed. The napkins were all handmade by Dot & Army and the subtle blue stitching against the natural linen had a rustic but refined feel. The menu, designed by chef Mike Poairkoff of Vinegar Hill House, was a “nose to tail” concept where each course made use of the heritage breed pork brought in especially for the occasion. We loved the fact that we were dining efficiently as a community and wasting as little as possible. Microgreens by Long Island’s own Good Water Farms accompanied the main course and added a beautiful accent the dish. The paper menus by Jeanne Lurvey also played into the theme, she used simple white lunch bags that she hand stenciled with the FEED logo and filled with a handwritten menu as a subtle reminder of the fact that as guests sat down to dine, they were also feeding others. For those of us who are embarrassed to admit that we still get confused by which side of the plate the knife rests, can you give us some pointers? There are a few tricks to remember. For example our favorite mantra is “BMW,” which stands for “bread, meal, water.” Read from left to right to remind you that your bread plate is to the left of your meal, while your glass is to the right. If you were a fan of Pretty Woman, you will remember that forks are to the left, and you should always start on the outside and work your way in for each course. The knife goes to the right of the plate with the blade facing in, and the spoon to the right of the knife. Do you have any tips for how someone could incorporate special details into a FEED Supper in their home? Never underestimate the simple thoughtfulness of a place card. It is a small gesture but we like the fact that when guests come to our suppers they feel accounted for and don’t have to scramble for a seat. You don’t need to get too fancy. Our co-founder Elise hand wrote each guest’s name on brown paper that we tied to the tops of jam jars by Anarchy in a Jar. We always give a small favor and with FEED Supper, we love the idea of giving a food item guests can take with them to enjoy long after the dinner ends. If you’re integrating place cards from the FEED Supper toolkit, we recommend also giving a little box of chocolates or a small bottle of cocktail bitters as a token to thank your guests for donating to the cause. Where can our readers find out how to attend a Filigree Supper? They can go to www.filigreesuppers.com and sign up for our mailing list or follow us on instagram (@filigreesuppers).